Pete is an ecologist. As his job away from Wordwood, he manages the Brisbane City Council’s Land for Wildlife and Creek Catchments. This page records his ecology activities at Wordwood. We purchased Wordwood with the intent of registering it as a Land for Wildlife (LFW) property. Pete was impressed by the quality of the native flora on the property when we inspected it for sale. We registered the property as our first priority and it now has the distinctive blue-green-square-on-its-point LFW sign (see the photo on the right) hanging proudly on its gate. Wordwood is in the Toowoomba Regional Council (TRC) area and, sadly, TRC is the only council in South East Queensland (SEQ) that does not support LFW. Thank goodness for the Queensland Murray-Darling Committee’s (QMDC) support for the program in the area. We are also supported by the program as operated by Healthy Land and Water (formerly SEQ Catchments) (HLW). LFW was developed in Victoria in 1981 and is now Australia wide. It is a conservation program that assists private landowners to protect, manage and rehabilitate their land for native flora and wildlife. It encourages the landholders to integrate nature conservation with other land management activities, such as grazing and hobby farming. It offers advice and opportunities to meet other LFW members. It is voluntary and free to join. In a nutshell, LFW is a way for landowners to express their choice to manage their properties for conservation and to get some much needed advice and encouragement from the officers working in the program at a grassroots level. See the links on the right to HLW, QMDC and other LFW property blogs. In May 2014, we hosted a LFW Open Day (see the photos by Deb Metters below and in the link on right to the HLW Flickr Album). This began out integration into the local community. Through contacts we met at the Open Day, we hosted a Toowoomba Field Naturalists’ (see link on the right) Outing in May 2016. Wordword has only a few older trees with hollows and this impacts its value as a LFW property. Over 180 Australian birds, mammals and reptiles use tree hollows for nesting and shelter. However, eucalypts are often at least 100 years old before they even start to produce hollows. To improve the habitat value of Wordwood, we are progressively dotting the property with artificial hollows – nest boxes. Our nest boxes are based on those made by Sunshine Coast company Hollow Log Homes (see the link on the right). The company has produced a fantastic book about nest boxes, including plans for a range of species. Pete uses the company’s nest boxes on projects at work and can guarantee that animals use them. Pete builds our nest boxes using ply, often leftovers. He screws everything together, making sure there are no sharp protruding points. He gives all surfaces a good coating of lanolin. Lanolin helps protect the timber from the weather and has the benefit of being non-toxic to anything that might decide to chew on the boxes. He hangs the boxes using old hose to protect the tree and a twist in the wire to allow the hang to extend over time as the tree grows – hoping the boxes last that long! He finishes the boxes with a couple of handfuls of tea tree mulch inside to replicate the rotting material found in natural hollows. Our first boxes were hung around The Nook in October 2012. One year later, we spotted an owlet nightjar using one. We often see microbats flying at dusk around Wordwood’s open areas and hung our first bat boxes near the dam in January 2014. We spotted a microbat using one in October 2017. At our Annual Bush Picnic and Camp in 2016 we put the kids – or more precisely their engineer dads – to work building additional nest boxes. These are now all hung. 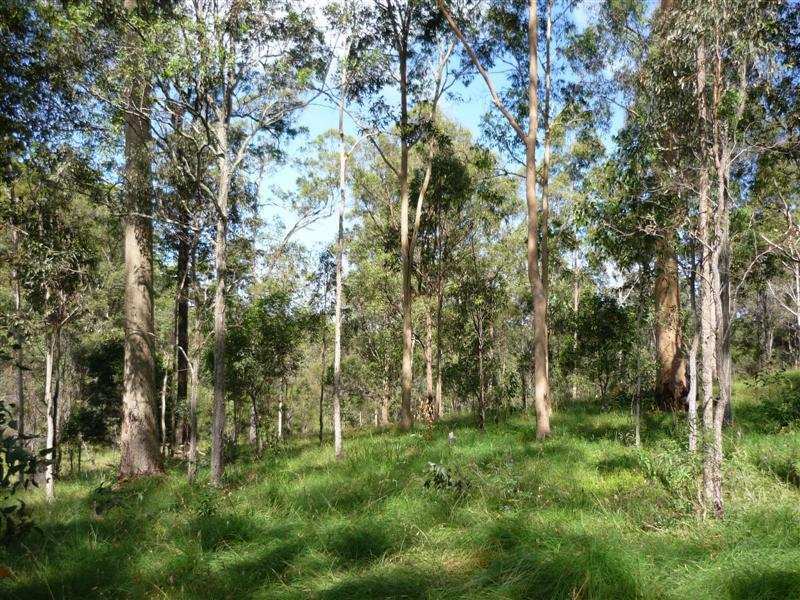 Pete has some experience of mixed plantings of native cabinet timbers using Mitchell’s Forest Farming System (Mitchell’s System) around Brisbane and Samford (see the link on the right). The system involves creating a regenerating native forestry area that is selectively harvested over time, replanting as you go. We were keen to give it a go in a previously cleared paddock at the front of Wordwood and also provide a buffer from the road and neighbours. However, one of the key species used in Mitchell’s System, silver quandong (elaeocarpus grandis), won’t tolerate the winter frosts on the Darling Downs. It is key because it acts as the nursery species necessary to produce timber trees, growing fast and straight and providing shelter for the main timber trees and driving them upwards in search of light. After much reading, consulting with friends and checking out what grows naturally around Wordwood, Pete came up with substitutes for the quandong. We planted our first area in December 2015, refreshed it in September 2016, and planted our second area in September 2017. We are waiting to see if the forestry will be a success for timber knowing that, if it doesn’t work, we’ll have an interesting patch of dry rainforest. The forestry plot is in the north-west corner of Wordwood. It has some of the best soil on the property, mostly a lovely dark loam and with a small patch of clayier soil running across it. It is protected from the worst of the westerly winds by a stand of eucalypts. As it was grazed until we bought the property, Pete only needed to remove a few straggly wattles. We planted in rows 3 metres apart and with a tree every 3 metres. The rows run roughly east-west. They were meant to be exactly east-west, but we left the compass in Brisbane when we marked them out! Pete chose 10 species to experiment with in the first planting (see the photo on the left). Each is local to the area around Wordwood. We used small numbers of each in order to get an idea of what does best and create a more natural ecosystem, thereby hopefully, reducing the likelihood of pests being attracted to a particular species. The bulk of the trees planted were black wattle (acacia melanoxylon) and brush box (lophostemon confertus). These are every second row and also spaced throughout. They are intended as the nursery trees but also have some value as timber, so once they’ve done their job they can be harvested. The first timber species were black bean (castanospermum australe), crows’ ash (flindersia australis), red cedar (toona ciliata), silky oak (grevillea robusta), white beech (gmelina leichhardtii), white cedar (melia azedarach), yellowwood (flindersia xanthoxyla), and as long-term harvest prospect, hoop pines (araucaria cunninghamii). For the refresh of the first planting and second planting, Pete chose 11 more species local to the area with which to experiment. They were Bailey’s Cypress pine (callitris baileys), brown pine (podocarpus elatus), coachwood (ceratopetalum apetalum), deep yellowwood (rhodosphaera rhodanthema), flooded gum (or rose gum) (eucalyptus grandis), forest red gum (eucalyptus tereticornis), green wattle (acacia decurrens), hairy rosewood (dysoxylum rufum), oleander wattle (acacia neriifolia), red ash (alphitonia excelsa) and rosewood (or Australian rose mahogany) (dysoxylum fraserianum). Wordwood has its share of weeds. However, one thing that encouraged us in purchasing it was that it is not too weedy. We spent many of our first weekends as the property’s owners, in Autumn and Winter 2012, weeding out the few prickly pear (opuntia stricta) and groundsel (baccharis halimifolia) and isolated clumps of lantana (lantana camara) and creeping lantana (lantana montevidensis). These are pretty much gone, so long as we keep up the maintenance. Stabbing and poisoning prickly pear is very satisfying (see the photo on the right). Not so much, cut-stumping lantana. Swallowing our pride, we developed a method of cut-stumping we call ‘bums-away’! It involves Margie leaning backwards into the lantana using her weight to bend back the branches so Pete can get in with the clippers and, then, as he cuts she poisons the stumps. Not glamorous but on sunny winter’s days we were quite content. After Pete heard at work about how well splat-a-gunning works on lantana, we switched to using it on lantana regrowth from August 2013. Man! Is it easier work than ‘bums-away’. It is a slow-but-good kill. The major weed on Wordwood is broad-leaf privet (ligustrum lucidum). It lines the creeks. It can cause despair. Early on, we cut and poisoned trunks 3 times only to see them reshoot. The original privet was so thick in places that nothing was left after killing it (see the photos below). However, we have avoided planting for revegetation, preferring to see what species come back naturally. We have planted a few weeping (also know as red or dropping bottle brush (melaleuca viminalis) along the creeks and near the dam and a couple of bunya pines (araucaria bidwillii). The bottle brush are common along Perseverance Creek downstream of Wordwood in Crows Nest National Park. They are so lovely we want to restore them to Wordwood’s creek banks. The bunya pine nuts should be good eating for future generations – just as they were for indigenous people in the past.